Let’s imagine we’ve had a busy morning and are on our way to grab a cup of coffee together. With us is a colleague who speaks three European languages, including English, but is a native Russian speaker. We’re doing what you do in narrow corridor: walking fast, talking, gesticulating and twisting around. Just in time, I spot a pool of liquid up ahead. 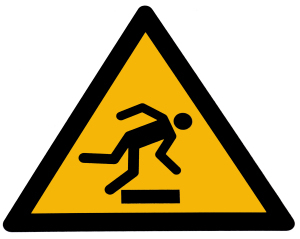 In a split second, and ever mindful that 28% of the 77,593 non-fatal workplace injuries reported in 2013/14 were slips and trips, I throw a warning over my shoulder to you and our Russian-speaking colleague. OK, you’ve been there. You can picture the scene. Now, let’s run the soundtrack. But hold on a minute – which of the 17* ways of saying, ‘Careful, someone’s spilt their coffee, don’t slip!’ will I plump for? One of the great strengths and delights of English is the sheer number of words in the language: every time I open my mouth or put pen to paper I’ve got a working vocabulary of around 35,000 words to choose from. And I’ll keep adding one new word a day until I’m well into middle age. Non-native speakers living in the UK work hard to keep up. They add between two and three new English words to their working vocabulary every day. But, by any count, building up a good store of health and safety speak is going to take them some time. Non-native speakers aren’t only up against it coming to grips with our mix of idiom, dialect and regional accent. We love our catchphrases culled from sport, pop, TV and film. And don’t forget to factor in trending slang, and even perhaps the odd workplace obscenity. 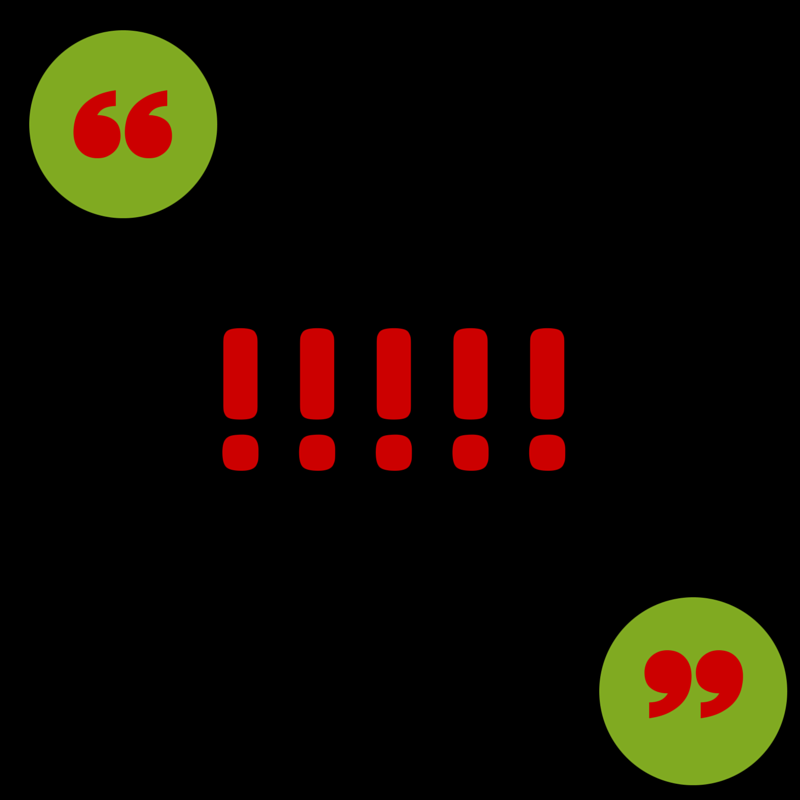 It’s no wonder that making assumptions about the language we use to warn of danger is fraught with danger. 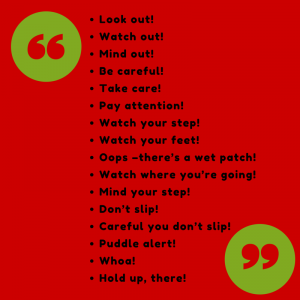 English is rich and can be very precise, but for the non-native speaker working in the UK, our colourful, colloquial, idiomatic language is often more like a trippy, slippery minefield of misunderstanding – in other words, it’s an accident just waiting to happen. *You can probably think of even more. We’re working with an increasing number of companies to translate their Health and Safety policies and procedures into the languages their workers speak and read fluently. Companies and HR managers employing us to translate everything from policy documents to induction packages and factsheets report strong business reasons for investing in quality translation services. We can also provide interpreters in over 100 languages so that you can communicate with staff and customers who speak languages other than English. We’re working with an increasing number of companies to translate their Health and Safety policies and procedures into the languages their factory workers, warehouse staff and field hands speak and read fluently. In a sector where margins are slim and employers and recruiters are traditionally wary of any additional costs, the companies and HR managers employing us to translate everything from policy documents to induction packages and Slips, Trips and Falls factsheets report strong business reasons for investing in quality translation services. 1 If safety was just common sense, UK companies wouldn’t have lost £2.9bn to health and safety failings in 2012/13 – the last year for which figures are available. Like other aspects of culture, attitudes to health and safety at work and what’s an acceptable level of risk vary enormously between countries. At the very least, bear in mind that people panic in emergencies. It’s hard enough following first aid instructions or emergency shut down procedures in English when you’re under pressure. Asking workers from overseas to translate and understand before they act wastes valuable seconds and could cost lives. Regardless of the size of the company, or the nature of its business, managers and Directors are increasingly held personally accountable for the safety of all their employees. New sentencing guidelines proposed by the UK’s Sentencing Council complete their consultation phase this week (18 Feb 2015). The new guidelines will come into force later this year and will cover offences ranging from workplace accidents, and dangerous products that cause death or serious injury, to near misses where there was a culpable risk of injury even if no one was actually hurt. Once confirmed, guilty companies and managers can expect longer terms of imprisonment and fines in the region of £2 – 10 million.